To celebrate SVP’s fifth anniversary year, we are inviting members of the shared value community to share five words that describe shared value. 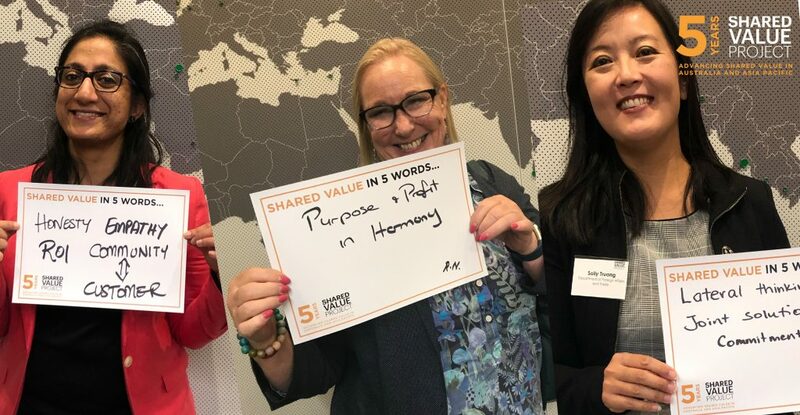 Share a picture on Twitter holding your five words, tag @SharedValueAust and go into the running to attend the VIP Welcome Reception at the 2019 Shared Value Summit Asia Pacific on Monday 17 June with leading national and international speakers including Professor Michael Porter. To be eligible, you must submit an image of your ‘five words’ template on Twitter and tag Shared Value Project via the handle @SharedValueAust before COB 17 May when the competition will close. The winner will be determined at random following 17 May. If the winner fails to respond or claim the prize within 7 days, a new winner will be drawn at random. The winner cannot exchange the prize for monetary value. The winner will receive an invitation to the VIP Welcome Drinks at the 2019 Shared Value Summit Asia Pacific on Monday 17 June. The prize does not include the costs of flights or accommodation to the 2019 Shared Value Summit Asia Pacific in Sydney. The winner will be expected to purchase a one-day or two-day Summit pass.